This hip, colorfully painted shipping container city recently sprung up just outside of Mexico City. 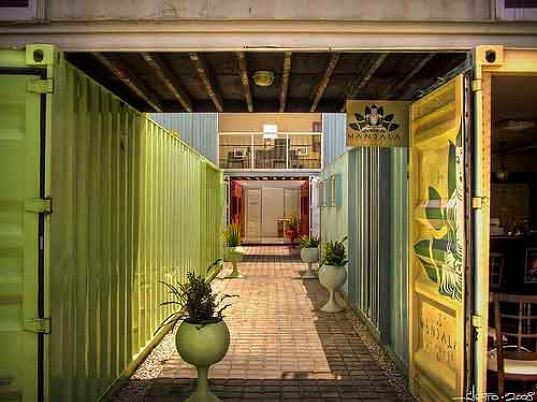 Created by a small community of businesses, the project features restaurants, gallery space, bars, funky stores and even living spaces constructed completely out of recycled shipping containers. Container City is located about two hours outside of Mexico City in Cholula, and is comprised of about 50 standard shipping containers. The developers took 4500 sq meters (48,500sq.ft) of space and plopped down the containers, stacking them to create courtyards, alleys and streets. The containers were then painted bright colors and outfitted with lighting, kitchens, dining areas and more. There is even an open public area with ping pong tables where people can go and hang out. The city consists of restaurants, juice bars, normal bars, funky little shops, bookstores, art galleries as well as a few residential apartments. There’s plenty of outdoor space to sit around and hang out and there are events and bands scheduled all the time. Container City is open Monday thru Saturday from 10am-8pm and Sundays from 11am-6pm. I just learned about it last week. Very interesting, isn't it? Specially in areas where housing is extremely needed, due poverty, natural disaster, etc. It's AMAZING!!!!! @kellyc: The containers actually exceed most US building codes for structure, fire, earthquake and hurricane when properly installed. It usually comes down to an aesthetic call on the part of the local zoning commission. When a project is done as well as this it will usually work. Container City is a very interesting architectural project that meets several needs. I wonder if such an installation would meet code in the US. Yesterday I was there! I'm Mexican, and I worry about to create these kind of "cities". First, Cholula is very far to the sea... to recycled those containers had to travel a lot of kilometers... What happen with the pollution? And, asked to the people and nobody knows what kind of materials the containers transport before. I asked because we don't know if is secure to live there, to cook and everything. All of the locals are a bars with a lot of plastic stuff. What Kind of recycling is that? I think that is only a Fashion Place not a solution to be "GREEN". It's beautiful (which I like) and pragmatic (which I like, but then I'm an engineer). How does it handle the heat? Have they added insulation, or added some kind of shade or layer immediately above the roof? That would make a huge difference in comfort. Wow, this site is visually stunning ...! Gorgeous images, and inspiring content. I also appreciate the over-all design. Thank you! Wow! This is really beautiful. I want to go visit it!